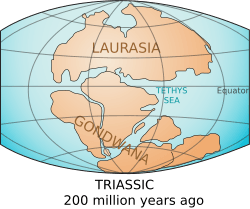 Laurasia was a supercontinent. It had been the northern part of the Pangaea global supercontinent. Pangaea split in the Jurassic into Laurasia and Gondwana to the south. Laurasia Facts for Kids. Kiddle Encyclopedia.